We are a full service interior plant design and maintenance studio introducing plant life to New York spaces. 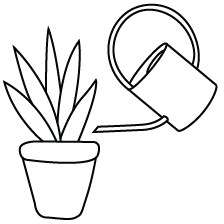 We love that plants inspire creativity, increase productivity, and purify the air and we're here to help you throughout the process. Residential, commercial and event design. Projects begin at $2,000. Select from bi-weekly and weekly plant care. Includes watering, pruning, cleaning, pest management. Our design process begins with an onsite consultation and a custom design proposal tailored to your space. Plants and planters are then sourced upon design approval and potted for you. Finally, delivery, staging, installation and a full plant care guide are provided. Say hello, get started and schedule a free consultation.